“I am like a cat,” explains Emmanuel Farré about his circuitous career path. Not exactly the comparison you would expect, but it’s apt. After eight years spent as a navigator in the French Navy, the Toulouse-born artisan known for his colourful hand-painted accessories briefly owned a restaurant, then worked as the general manager of a supermarket before finding his footing in the world of shoes. Though he is self-taught, it is easy to see how becoming an artisan wasn’t happenstance for Farré. His father, the owner of a bespoke men’s clothing business, and his mother, an antiques dealer, both encouraged creativity. “Style is a matter of education. You have to experiment,” says Farré. Frequent buying trips to the antique markets in Paris helped inform his sophisticated aesthetic. He also credits working on miniature models as a child, and delicately painting each tiny piece, with honing his meticulousness and further feeding his imagination. Five years working in the French fashion industry led to an opportunity in Toronto with the men’s accessory company Loding, where Farré made a name for himself customizing stunningly decorated loafers, brogues and boots. In his studio today, the painstaking process involves stripping a shoe down to the rawest form of the leather before beginning to bring it back to life with his palette and paintbrushes. “You have to remember, the leather is sensitive, it is alive,” says Farré, who uses the sfumato technique, made famous by Leonardo da Vinci, which allows tones to shade gradually into each other. Eight to twelve layers of dye applied over two days is followed by a coat of varnish to lock in the colours he so carefully curates. This fall, in addition to opening his leather salon at Yorkville Village, which will offer resoling, repairs, restoration and his signature patina hand-painting, Farré is taking on a new challenge by launching his own line. Eight months in the making, the handcrafted shoes for both men and women will be available at his Farré by Emmanuel boutique at The Fix. 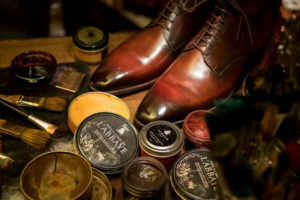 No detail was overlooked, from selecting the small family-owned shoemaker who cobbles the soles to commissioning the tannery that has been in business since the 16th century and offers ultra-lightweight leather and linings. Farré personally tests every prototype to ensure the comfort and quality of his shoes, and, for customers in search of a truly one-of-a-kind experience, he will also be offering a bespoke service. Perhaps Farré’s feline instinct isn’t so farfetched. It was the sum of his experiences that steered him towards his craft and enabled him to, literally, land on his feet. As Farré astutely puts it, “your shoes are important; they say a lot about who you are”. Farré by Emmanuel, coming soon to The Fix.